Whenever I think of Sicily, I can’t help but conjure up images of mysterious figures lurking down dark alleyways – I think that comes from me reading one too many Italian crime novels! It took me a few good years to make it down to Italy’s boot. Mum and I did a tour of Calabria some years back, and we popped over to Catania in Sicily for the day. It’s funny how some memories are so vivid, as I can remember what book I was reading at the time of that trip…’A death in Calabria’ by the writer Michele Ferrara. I can even remember the summer dress I was wearing on that hot and sticky day…it was blue and white stripes. I have a photo of me sitting at the fountain in Taormina Square, and just as a gust of wind blew my dress up, Mum pressed the shutter....ha, happy times. So, it was time I ventured back ‘on-my-own’ to get lost in the streets with my camera. I was also well prepared with some top tips from a work colleague and Sicilian, Emmanuele. The timing of this trip was a birthday trip for myself too, although it turned out to be more of a ‘soul-searching’ trip. Life threw up a huge curveball for me at the beginning of October. And, without dwelling on it too much, it was a sad time for the travel industry. Monarch Airlines – where I’d worked for 20 years collapsed – and so I was left feeling a little all over the place. In some way’s I’d been waiting for this day for months, I’d been toying with the idea of leaving my job – but I knew I wouldn’t make that leap without a gentle nudge. So why was I so heartbroken? I should have been happy, right? Well, I loved the people I worked with – we were like a little family, and I don’t think I fully appreciated those people until they were no longer around me. I had a sense of purpose and place. I had a routine. I knew what I was doing and everyone around me knew me and what I was capable of. Don’t get me wrong, I got so frustrated with the place at times, I swore I was going to leave more than once. I’d been angry to the point of tears many times, but that’s part and parcel of working for a larger organisation = office politics. But, I was 19 years old when I joined Monarch (back then Cosmos). I’d practically done my adult growing up there. All my hard work was going to end in a rubbish dump somewhere. That thought saddened me. So, my Sicily trip was a perfect distraction from the fact that I was now redundant from my job. I wouldn’t get to work with the people I’d said goodbye and wished ‘happy weekend’ to on the previous Friday night. It was a time to reflect, do some soul searching, and ask myself ‘what do I want to do next?’…I knew in my heart what I wanted to do, but my heart was kinda heavy – ok, SO no one died, not really – just a name – but it was still a complete shock. And, it didn’t end on ‘my’ terms. I’m a big believer in ‘things happen for a reason’, and I was starting to realise this ‘hiccup’ was a blessing in disguise. I could do something for ‘me’ now, and focus all my energy on the things I love and those that I’m passionate about. …Anyway, enough about that… let’s talk Sicily! I realise as I’m reliving and writing about this trip, I’ve already waffled on - a fair bit - before actually even making a start on talking about Palermo! And so, I’ve decided to structure this post by breaking it into two posts. One; so that it’s not ridiculously long, and you get the most out of it (hopefully, it’s inspiring too). And, two; I get to relive, and write down what made it this trip so special. I’ve decided to share ‘what I did’ on this trip, followed by a little snapshot of ‘Palermo’s legendary food’. My Airbnb couldn’t have been better placed. I always try to get a location that’s central – mainly so I can be out exploring from super early morning until late at night – although more often than not, I tend to tire myself out from getting up at sunrise and I’m usually in bed by 9pm drinking a cup of tea! Anyway, my cosy home was right in the centre of the old city, and perfectly located between the markets - something I was very happy about. 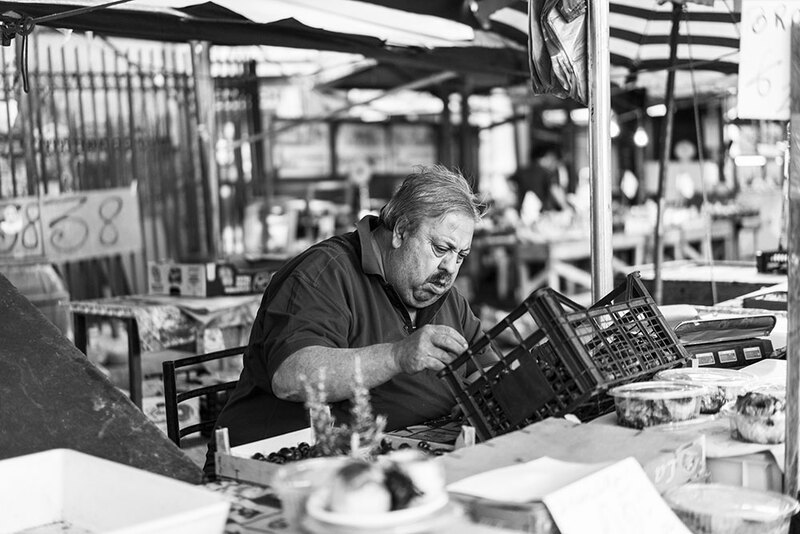 I love a good local market and it meant, I could get up early and observe market life as it sprang into action. I’d heard Palermo’s markets were some of the best, and OMG ‘insert heart eyes’ I wasn’t disappointed. Today’s Palermo disproved any lingering Mafia images. I’d read that Palermo’s streets were intense with purse snatchers; that it was chaotic and run down, and ok, some of the buildings can be a little rough around the edges, but that’s what makes everywhere so alluring, so mysterious and so incredibly charming, but as for the chaos and purse snatchers, nah, I didn’t find that at all. The city is colourful, yet traditional. It feels perfectly safe. It’s youthful and trendy, and the Sicilians are some of the warmest and friendliest. The city makes it easy to become a temporary Sicilian and that’s reason enough to visit. You don’t tour Palermo, you live in it, and that’s exactly what I did. The way of life offers any visitor more than any monument or museum ever could. First stop…the markets. There are three of them; Mercato di Ballarò, Mercato de Capo and Mercato della Vucciria – all within walking distance from each other. And, hands-down THE best fruit, vegetable and street food markets I’ve been to so far on my European travels. The warmth and buzz of each market – each with their own character – will give you smile wrinkles. And, yes, you’ll want to eat a lot at each market! I adopted a little routine of walking to Mercato di Ballarò early every morning – it was the closest market to where I was staying. I tiptoed through the vendors as they set-up shop for the day. Men shouted out ‘ciao’, a wrinkled woman filled her crumbly window frame with a toothy grin, fishmongers’ feet peeped out from behind their tables and crates filled with silvery sparkly sardines, a tubby man stood on a fruit crate peeling an orange, the juice dribbling through his fingers, it was a perfect start to my mornings…and then I made my way to Mercato de Capo, this was my favourite market. It’s larger in life, and attracts a huge crowd. Lots of merchants, housewives and elderly folk hustle and bustle about this market shouting out to each other, young guys speed past on mopeds, laughing, gossiping and buying goods every day. People head through the streets on their way to work or school, or on their way home. A contagious energy fills the air from early morning until the evening. Standing in the mix of all this hustle and bustle filling my tummy with a pistachio cream infused croissant in the morning or waiting for the chestnut man to fire up the coals for a cone of hot roasted chestnuts (these became my Sicilian addiction) fills me with such happiness. I loved watching the scenes play out in front of me; two men having playful banter with each other, an elderly vendor ensures his display of aubergines is just-right – no aubergine or artichoke is out of place, a little boy wanders curiously and cheekily looking at the assortment of fish, a housewife ponders whether to buy a cauliflower or broccoli, a group of men gather at the panica meusa stall. This traditional Sicilian sandwich containing – brace yourself – chopped veal’s lung and spleen seemed extremely popular with the workers and locals. Translated ‘panica meusa’ literally means ‘bread with spleen’. On one of my afternoons, I made my way through Mercato de Capo as I’d proudly found a short cut from the station. I decided to stop and watch the activity from a different vantage spot. I’d been buying my roasted chestnuts from a vendor further on in the market, but another guy caught my eye. Maybe it was his jolly charisma. Maybe it was his passion. It showed that he took care and loved what he was doing. Maybe it was because there’s nothing like a good chestnut perfectly roasted with salt, and piping hot ready to peel and pop into your mouth. I guess he could tell I’d taken a particular liking to his chestnuts, because he gave me extra once I’d finished my cone. He then shouted out to his wife, who popped out from the apartment above him. I had no idea what he was saying to me, but I worked out that he had a ‘piccolo bambino’ and she too popped her head out on the balcony and waved her chubby little hand at me. Bless…I love little moments like this. The best thing about Palermo’s markets is that they never sleep. I felt that La Vucciria was a slightly more touristy market selling souvenirs and clothes, although at night it’s where all the trendy and young hang out, and that’s when I felt its real atmosphere. ‘Vucciria’ translated means ‘chaos’ in Sicilian. Stalls sell freshly grilled and fried fish on paper plates take stage, smoke billows into the crisp evening air, and it’s where the young gather to snack on street food, drink beer, wine and generally chat the night away. It’s got a similar vibe to London’s Shoreditch with street graffiti and bars pumping out chilled out music. Visit a vertical neighbourhood in the city and you’ll find small apartments stacked high above the streets. Faded rainbow laundry hangs out to dry; the balconies are a true Sicilian curiosity, covered with tarpaulin to keep in the heat, planted with trees or sculptured in an extravagant baroque way; elderly men sitting outside their front doorsteps watching the world go by. Craning my head upwards I wander the streets looking for pockets of light and taking photos of anything that catches my eye. The mix of cultures in Palermo is fascinating. You’ve a medley of architectural styles, a unique array of traditions and a colourful variety of cuisine. Sicily has a rich history. Its ancestry goes back to having been invaded by the Greeks, Romans, French, Swabians, Arabs, Spanish to name just a few, and each dynasty left its own unique stamp on Palermo. If you look closely at some of the architectural gems in the city, you see influences of this and that’s what I loved. It’s so different. If you find yourself in the city, take a close look at Palermo Cathedral. It’s just one example of a building that’s undergone many changes. You’ll see many different religious styles. I loved taking an evening stroll to the cathedral just as sun was setting. Views over the city saw me climbing up Chiesa di Santa Caterina. It’s easy to overlook this church from the outside as it’s fairly unassuming. But, the outside entrance belies the stunning Sicilian Baroque beauty on the inside, and the 360 degrees view from the top kept me snapping photos for at least half an hour or more. Another view that left me with heart shaped eyes was the view towards the red roofs of San Cataldo. You’ve got to snap a photo of what I would say was a quintessentially Palermo view...oh and Palazzo dei Normanni. One of the main highlights is the Palatine Chapel, situated on the ground floor. You can’t come to anywhere in Italy and not partake in my favourite tradition, the ‘passeggiata’, a slow walk before supper (or after) …or both. It’s where people of all ages stroll through the streets. You’ll see couples arm-in-arm, people chatting and laughing and children playfully running around carefree and happy. It’s not only a time to see and be seen, it’s a chance to meet up with maybe a business partner, or friends to linger over coffee, gelato or an aperitivo. A great people-watching spot is the area around Teatro Massimo. You might remember it from the final scenes of the Godfather…or you might know it for being the third largest opera house in Europe. Cefalù is different to Palermo; it’s a small town right by the sea, it’s less busy (although I can imagine during the summer it gets very touristy); it’s also less gritty than the city with pretty little cobbled streets, cosy trattorias and souvenir shops. The town doesn’t offer a huge amount in sightseeing. I’d say the Duomo is perhaps the main place of interest here. My favourite spot though was the area around the Duomo; the main square (which felt more Arabic with its palms, exotic trees and soaring mountain backdrop). It’s where the local atmosphere was alive in the Italian cafés. I watched an elderly couple trying to squeeze their rusty red fiat 500 into a parking space, I listened to an animated couple of gentlemen speak with their hands; so-Italian. I was hoping to take the two-hour walk to the top of the town as I’d heard the view was pretty spectacular, but the path was closed for filming. Oh well, maybe next time. And, I hopped on a bus to Monréale...once I’d found the right bus stop! I stopped to ask an elderly gent which direction I should head in for Monréale, and he opted for the wrong direction, bless him. Luckily sense of direction (and Google maps) made me stop and I cross the road. I hadn’t planned on visiting this town, but my Airbnb host said it was his favourite place and the cathedral was out of this world, so I thought why not…Monréale is set in a rather striking hilltop location, and yes, it really does have one of the most stunning Cathedral’s. I was in awe of the golden mosaics which cover its entire walls, and ceiling. It’s staggering to imagine the level of skill required and even more so to think the work was carried out over 900 years ago. And, as you climb to the highest point in the Cathedral, you’re rewarded with a sweeping panorama of the Conca d’oro, the Golden Valley.